Offering you a complete choice of products which include cctv cable for elevators. 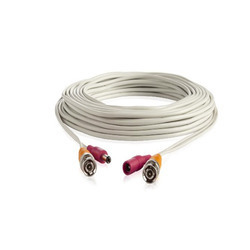 We are offering excellent quality CCTV Cable for Elevators. The products are designed and developed using high grade material, sophisticated machines and quality tested at our vendors end. Our products provide safety to the property of users and they have superb durability. These are fine in designs and these products are long lasting, abrasion resistance and our products are manufactured as per national and international standards. These are available at pocket friendly rates. Looking for CCTV Cable for Elevators ?